Debra is a single mother of two daughters and one son ages 15, 11 and 4. She is a para teacher within Jefferson County Schools and was struggling after the breakup of her marriage. She learned about Hands from Colorado Homeless Families and is working with Women With A Cause (another one of our great partners) to continue her education with master’s degree in special education. Debra has a graduation date in spring, 2018. She has had a bumpy road on her journey but continues driving forward to gain her self-sufficiency. Hands’ vehicle placement program is growing! 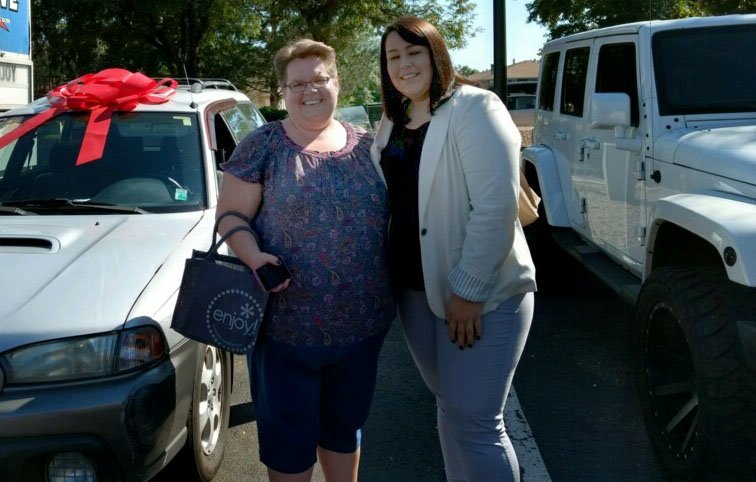 Debra received her vehicle because of a collaboration with one of our partners – Stan’s Automotive in Lafayette, Colo., and a local Napa store in Louisville, Colo.
Not to be left out is the vehicle donor who was simply visiting friends in Boulder on her way back to New York when her Subaru broke down. She was nervous to keep driving it so she looked up local vehicle donation options in the area. She found Hands and agreed with our mission. Stan’s Automotive picked up the vehicle in Boulder, then their team professionally performed all the work to get it in top shape for Debra.